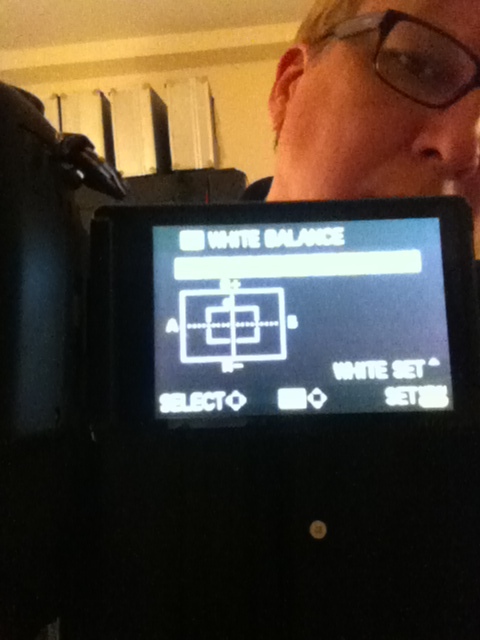 So, I have an issue with how to write down the white balance settings on the GH1. Maduka came up with a system. That is, on the x axis you click once to the left (for -1) and then on the y axis you click up 8 (for +8). And that will give you the color balance we used on The Prometheus Trap. Photographing the screen on the GH1 with an iPod is not ideal. Of course, we also used Canon S.S.C. manual lenses -- usually at about an f2.0 -- on the camera. And that's a big difference over the stock lens. And I like the stock lens. It's just that there's something about these old S.S.C. lenses... I don't know what it is. The stills we have use exactly the same color balance and settings as the motion picture we're shooting, so they're an accurate look at what we shot.